I have been wanting to try planting according to the moon for ages, and carefully marked on my calendar that the first weekend in April was the prime time to plant root vegetables. The time of the waning moon, when the gravitational forces pull the roots down into the earth., supposedly giving them a good start in life. Then I threw my back out -a common side effect of gardening! I remembered the seed tape I had made years ago, and wondered if that would not be the answer to my dilemma. Nothing is actually better for my well-being than sorting through my seeds and imagining huge harvests. 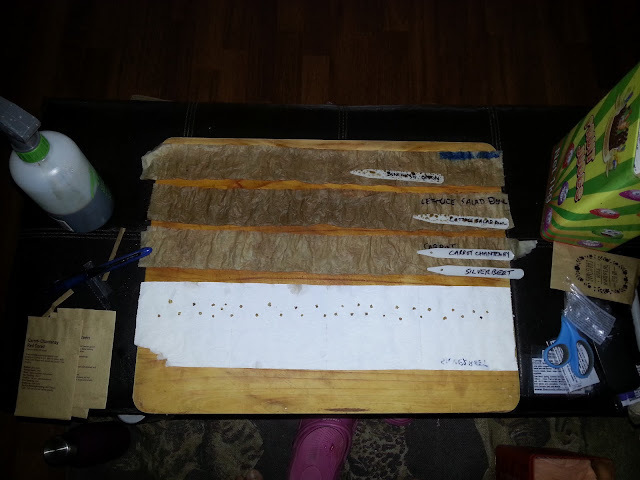 I sat on the couch and laid the strips out onto a wooden board. Spraying with a seaweed spray as I went along to give those little seeds a taste of things to come. I have pretty tight spacing, and stagger the seeds to get more in. I start picking leaves when they are still small, so they can be pretty close together. 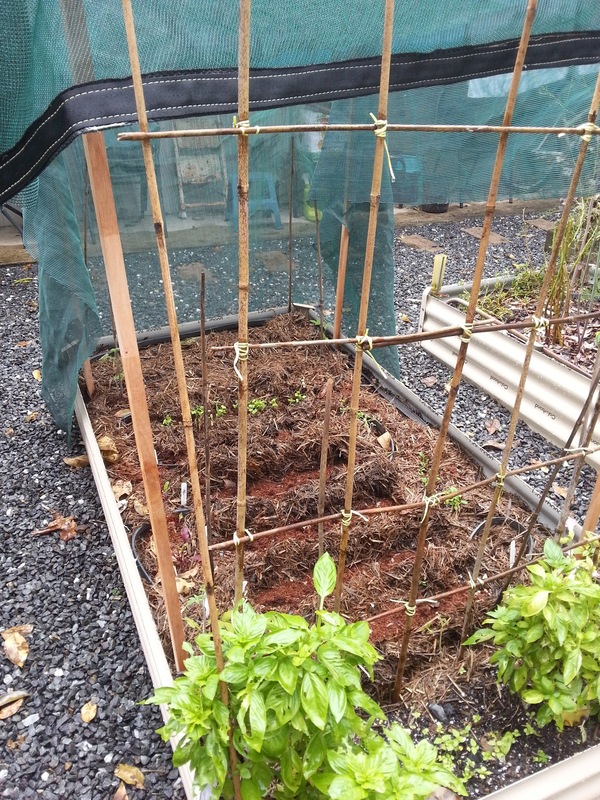 I already have tatsoi going down the one side of the bed, and beetroot down the other, so the strips did not have to be very long. 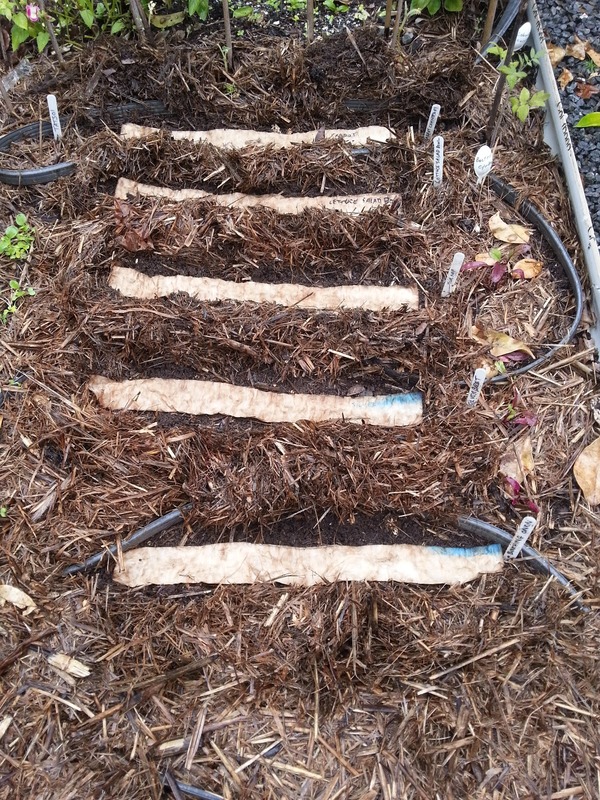 I pulled away the mulch, and sitting on my little step stool, gently laid my seed tape into the furrows. I have carrot, turnip, and bunching onion, with silverbeet and lettuce in between, so not only root crops. The soaker hose meanders between the rows just under the mulch. I like to use brunnings seed raising mix which comes in a compressed block. I sprinkle the dry mix over the seeds, and then wet it down afterwards, and find that I can get a nice even layer that way. We are still having some heavy rain, and then when the sun does come out it can be pretty intense, so I suspended a piece of shade cloth over the bed. This was a piece I cut from a large shadecloth from the pool area that was being replaced. 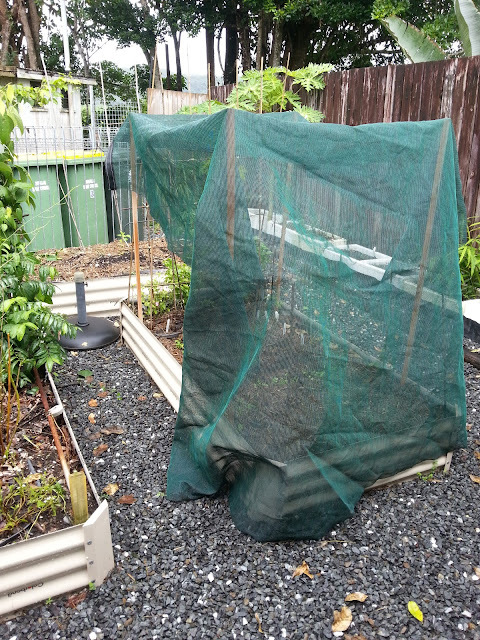 I will see how it goes in the wind, and if it allows enough light in once the seedlings start to poke their heads up. I do have lots of tiny green grasshoppers around so sprayed a little garlic chili spray onto my basil to deter them. The cucumber plants that came up from seed a couple of weeks ago have been decimated! I have a few seedlings in my greenhouse to plant out once we reach the next phase of the moon, when you plant plants that tend to grow up. That will be in the waxing moon phase. do you plant according to the phases of the moon? seeds or seedlings? The moon planting sounds interesting...would love to know how different it is than planting out starting in the seasons. at first I was very skeptical, but it has something to do with the gravitational pull of the moon - in the same way that the tides work. I am yet to be convinced though! I am lucky to plant anything let alone wondering what the moon is up to ... though I did notice the nice moonlight the other night. I bought the moon planting calendar from Anne at The Microgardener and need to get some of my seedlings in the ground as it is the right time but the beetroot will have to wait for a little while. It is the pits when you hurt your back. Been there done that! Bad backs and gardening don't exactly go together unfortunately. I hope you feel better very soon. I just referred to the calendar in the better homes and gardens magazine. I planted some beetroot a while back - no idea what phase the moon was in then, but they seem to be doing well so far! It is a slow process with backs and gardening, since it is so hard to just not do anything! Now you need to plant some of the same when the moon is full and see if there is a difference! But then the weather may be different so who can really tell. Exactly! so in the past when I have done these experiments I forget about following up. I do keep planting throughout the season to fill in gaps, and cant say that I have really noticed a difference. there are so many variables! I've seen that moon planting calendars in the Better Homes & Gardens magazine, but never paid attention to it. I remember being told you should only plant in Spring, now it seems it can be done the whole year round. I think a lot of of aspects come into play as well, so the moon planting is just one aspect. Meg, I think in our climate, the heat is one very important thing to watch out for! Very interesting, I think a lot of old cultures were much more attuned to all parts of nature than we are! I have no idea which culture this moon calendar follows, that is worth researching.